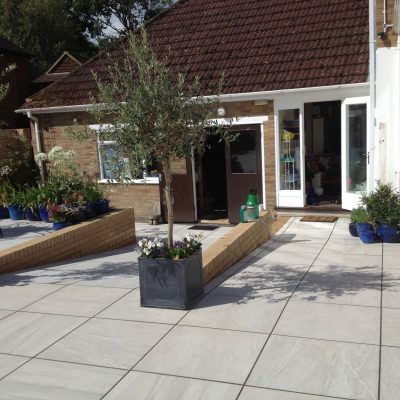 Kebur Burlington Porcelain Paving is supplied in an eyecatching 900 x 600 x 20mm size. Inspired by the subtle flecks and distinctive veining of Burlington stone from Cumbria, the generous size format shows off the richly varied appearance of each tile. Available in three consistent colour tones, Burlington porcelain will bring a truly luxurious feel to any garden. Choose from Grey, Sand or Ocean colours. If you are looking to create a seamless space from inside your home to your garden, we can supply thinner floor tiles for internal use. These 9mm internal tiles are slightly smoother than their 20mm thick equivalent flagstones, which are a little more textured for grip as they are designed for external use. Just ask us for details. If you need alternative sizes or special pieces (steps, copings, risers, drain gullies etc) we can supply these to order. Just ask us for details. Contact us for advice on laying porcelain.